moments to be found everywhere! The sun, the sun! Finally the sun appeared. All was not perfect though. That biting wind was still there. I managed to get my layers right though, as well as donning that all important neck scarf. That scarf plus the hood on my jacket made all the difference. I was comfortable. Today I had two areas I wanted to cover. The first was to walk the High Line. 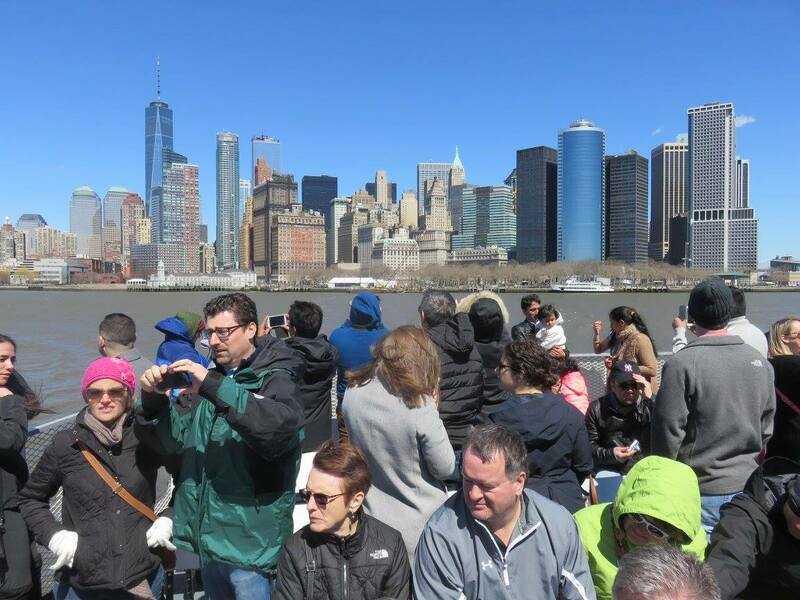 Then in the afternoon I had booked a 1 p.m. boat to the Statue of Liberty and Ellis Island. In general I try to avoid the super touristy areas as they are usually really crowded and the waits can eat up most of a day. I decided to fit this one in as I am intrigued by history. Ellis Island in particular was an area I wanted to explore. Off I headed to enjoy my first adventure - walking the High Line. I was again not feeling 100%. No worries, Tony was waiting for me on the subway. On the weekends, singers jump on and off the trains singing acapella and holding tip bags. My toes were soon tapping and a smile arose. Tony really didn't want to pause for a photo, but as I wouldn't tip him if he didn't. He was a good sport and tried his best to smile. As I strolled on a leisurely pace from the subway stop to the park's northern entrance, I was passed by crowds of those hurrying to GET THERE! Again, slow down and look around your. The mix of architecture alone is amazing. 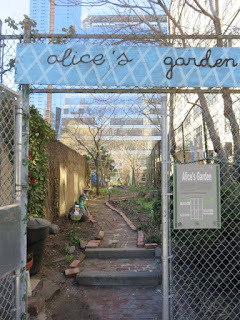 And everyone else walked right by Alice's Garden (a tiny community garden tucked into the concrete landscape) without even seeing it. 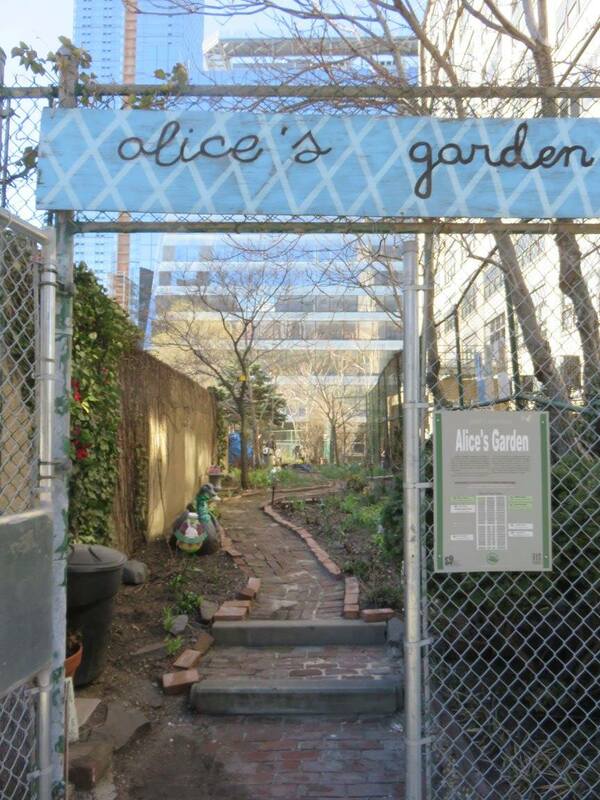 In a quick search I found there are 30 secret gardens scattered about Manhattan - more HERE. costumes. Nope - in jackets and long pants, just the music and headpieces to attract the crowd. In the far right image, I saw this building from several angels and never did figure out what the structure was on top of it. The High Line was originally an elevated train track running from 34th St. to St. John's Park Terminal at Spring St. After the last train ran in the 1980's, the battle began on whether to demolish the track with the owners were pitted against Peter Obletz, a Chelsea resident, activist, and railroad enthusiast. In 1999, Friends of the High Line was founded by to advocate for the High Line's preservation and reuse as public open space. In 2002, the planning began. In 2004, a design team was selected - James Corner Field Operations (a landscape architecture firm), Diller Scofidio + Renfro, and Piet Oudolf, planting designer. In 2005 the city accepted ownership and April 2006 was the groundbreaking ceremony. Although the city has ownership, the Friends of the High Line raise 98% of the parks annual budget. There was a wide range of architecture from old to new. I asked a woman to snap my image and we connected. She was in town for her daughter's 25th birthday and was out for a morning walk. We walked, talked and checked out the scenery together. You are never alone in NYC unless you want to be. During the right season this is very lush with tall grasses and trees full of leaves. Despite being a bit off season, you could find small examples of the flowers starting to open. The walkway winds along the water and through tall buildings. Grasses, trees and flower gardens line the sidewalks, all planted and watered using green techniques. There are benches at regular intervals so you can relax and enjoy the view as well as several on off points along the route. I started at the north end and walked all the way to the south end which landed me right in The Meatpacking District. While most of the flowers were not yet blooming, I found small offerings tucked in here and there. Unique art, fabulous skyline and yes, there is even a driving range here! 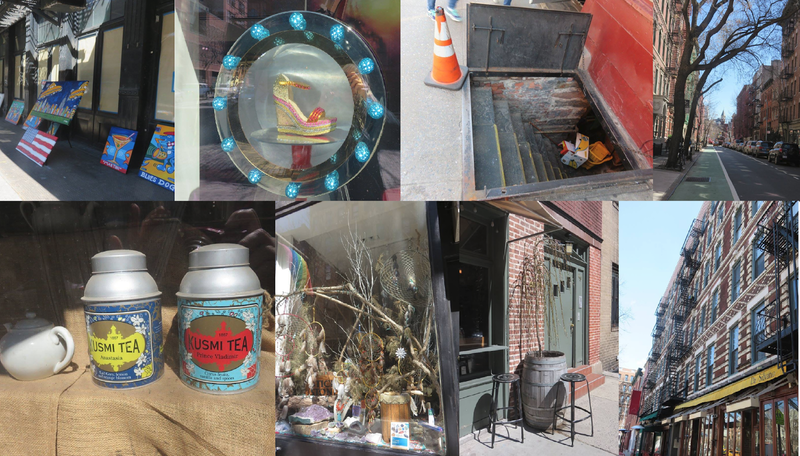 Next came a stroll through the Meatpacking District. This is one I will have to do a walking tour of next time. There were artists lining one of the sidewalks displaying their wares and while the area looked a bit rundown and old, there were surprises. I turned one corner and stumbled across a small store featuring crystal encrusted shoes by Christian Louboutin. Turn another corner and it's a unique Tea Shop. A truly interesting mix. As I slowly headed east toward Greenwich, I snapped pics along the way. One thing to watch for is open covers that let shopkeepers access their basement storage. Most put an orange cone up - but as you're looking around it can get missed. Lunch today was a pizza. My Greenwich tour guide had recommended three pizza places, but only one sold by the slice - Joe's. I had to take a picture of the mob. It was a tiny place with just a few bar stools along the window. I was in a line of I would guess 15 people crammed into a very small space. There was a limited selection of about six pizzas. You ordered, paid and were handed your slice on a paper plate. There was a jar of grated cheese and one of crushed red pepper to sprinkle on it. Most of us didn't fold the pizza to eat it, we folded the plate with the pizza in it and then walked out napkins in hands munching. It was delicious. Repeat after me - if I visit NYC I promise to not come when Easter, Passover and Spring Break are all running at the same time. My next destination was Battery Park to pick up the ticket for my 1 p.m. boat to the Statue of Liberty and Ellis Island. I had booked the audio tour at each. Left - check out the super tiny (by comparison) older building between the 2 towers! Centre - 2 lines at least 6 people wide each merging at the security tent - CRAZY! I picked up my ticket and then joined a line six people wide that snaked around the park. Next to it was another "Pass" line that was also six people wide and snaked around the park. Both converged at a security tent off in the distance. Turns out a 1 p.m. ticket doesn't mean you're on a 1 p.m. boat. It's to get the the security line and go through an airport style security line-up. If you're claustrophobic like me - this is a challenge. Shuffle, shuffle, shuffle. the view and the crazy mayhem. By the time I actually got on a boat I knew there was probably no way I could do the audio tour on both islands. So I got off at the Statue of Liberty and got right back in line for the boat to Ellis Island (yes this is TWO boat line-ups and rides). Once there I picked up my audio tour kit. The clerk's instructions were a little off from the audio's instructions so I had a bit of trouble getting started, but soon I was lost in the intriguing history of the place. It came alive for me. I think this is something you need to see and hear, so I'm just going to share some images at the bottom to entice you. Note - if you are visiting NYC at low tourist times, the 1 p.m. might let you do both Ellis Island and the Statue of Liberty as it states on their website. But based on what I saw today, I would take the earliest boat available regardless. You won't have to rush no matter what the crowds. And take the audio tour at each. It makes a huge difference. And if you want to go up the Statue of Liberty elevator, you have to book many weeks in advance. After returning, I walked by Ground Zero, but was way too tired to deal with the crowds there, so really can't comment on what is available. The historic site has tours and there was a building to go in, but again it had a LONG line and I was done with crowds. I headed back to Cafe 53 to pick up my evening meal and then back to the Airbnb to upload my pics and relive the day. Another fabulous day and I still had three more days of exploring to go. Amazing! By the end of the day the wind was dying the the prediction was for the next two days to be sunny and warm. I couldn't wait. would let the next inspector know where to send you. Those bunks in the holding area are tight together. Each bed sleeps 2, they are stacked 3 high and there are 4 rows.